The new dashboard shows student usage, progress, performance, and mastery data for all Reasoning Mind programs that are now part of Imagine Learning: Blueprint, Foundations, STAAR Readiness, and Smarter Solving. District administrators can view data at the district, school, teacher, grade, and class level. Campus administrators and teachers can view data at the same levels for students in their school or classes. The home screen displays a snapshot of data in 5 cards: Launch Status, Usage, Progress, Performance, and Mastery. Click "See More" on each card to go to the corresponding tab with more detailed information and additional graphs. The Launch status card gives administrators a snapshot of how rostering is going. The orange line shows the number of student accounts that have been created, while the blue line shows how many student accounts have been utilized. 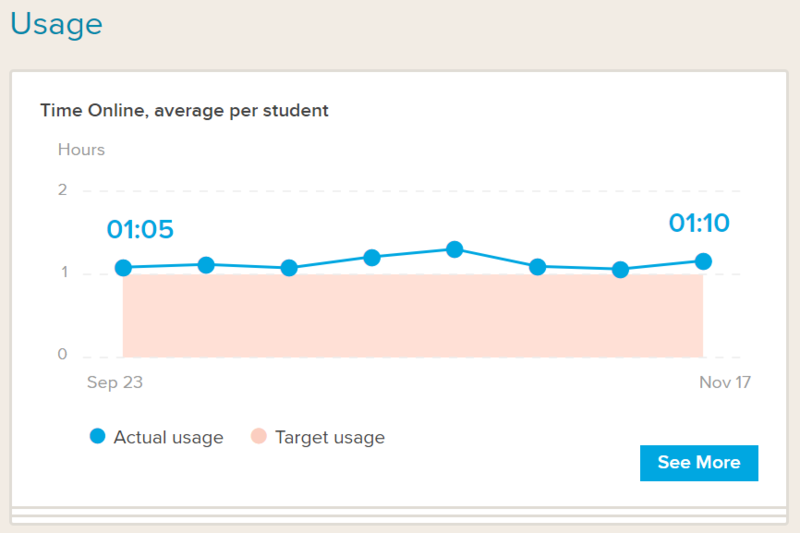 The Usage card shows how much time students are spending online in the programs. The blue line represents the average time online of all students who have logged in during the selected date range. The orange line represents the target time online for those students, which varies by product and grade level (e.g. 60 minutes/week for Blueprint and STAAR Readiness). The Progress card shows how much grade-level material students have been exposed to on average. 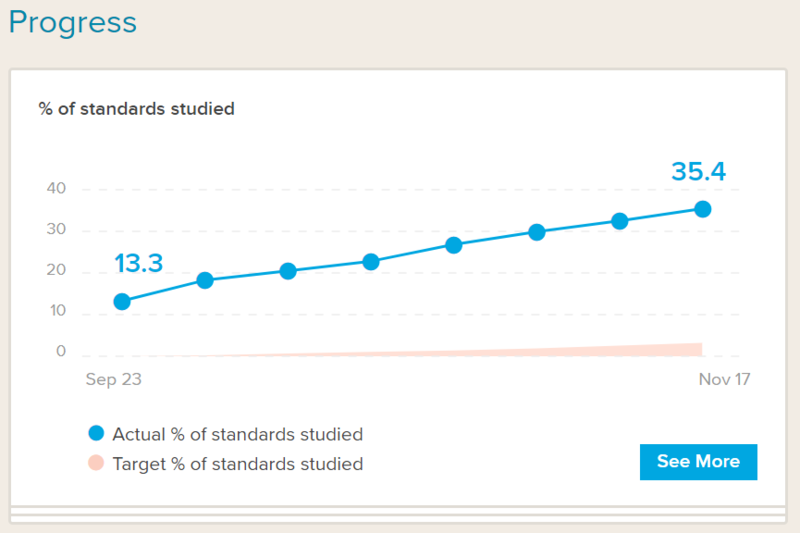 The orange line shows the average percentage of grade-level standards students have studied. (The average is taken of all students in the selected group who logged on during the selected time interval.) The blue line shows a target which varies by grade level. The Performance card shows how students performed on the content they have covered so far, measured against state expectations. 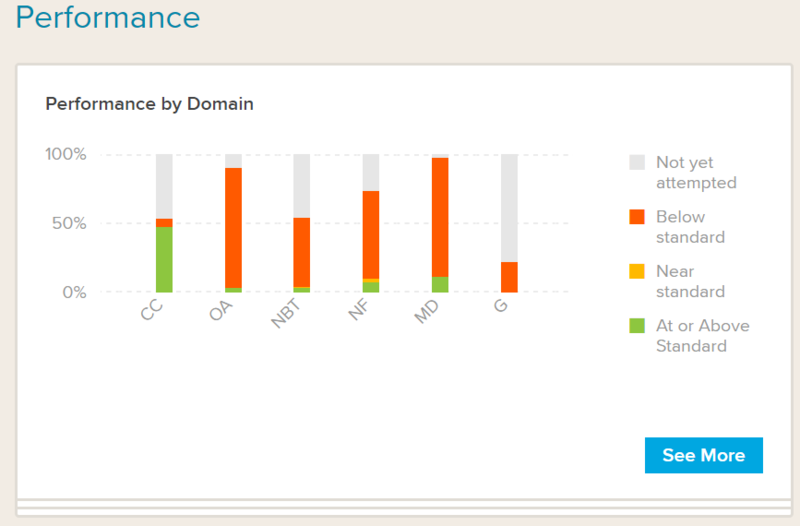 Performance is reported for each Common Core standard, if a single grade is selected, or for each domain, if multiple grades are selected. For districts in Texas, performance by TEKS or Reporting Category is shown instead. The Mastery card shows how much grade-level material students have mastered. 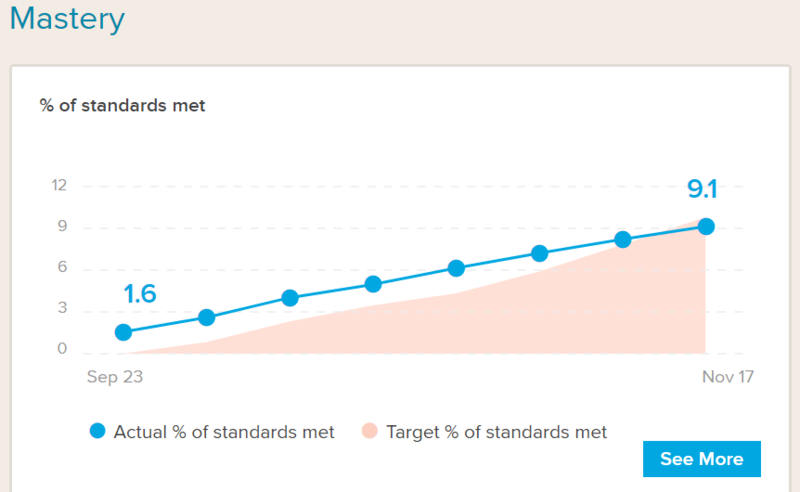 The orange line shows the average percentage of grade level standards that students have mastered, while the blue line shows a target that varies by grade level.